Princeton University Press has made available a sampler of pages from the book in pdf format, here. Deinonychus antirrhopus was discovered by John Ostrom in 1965. 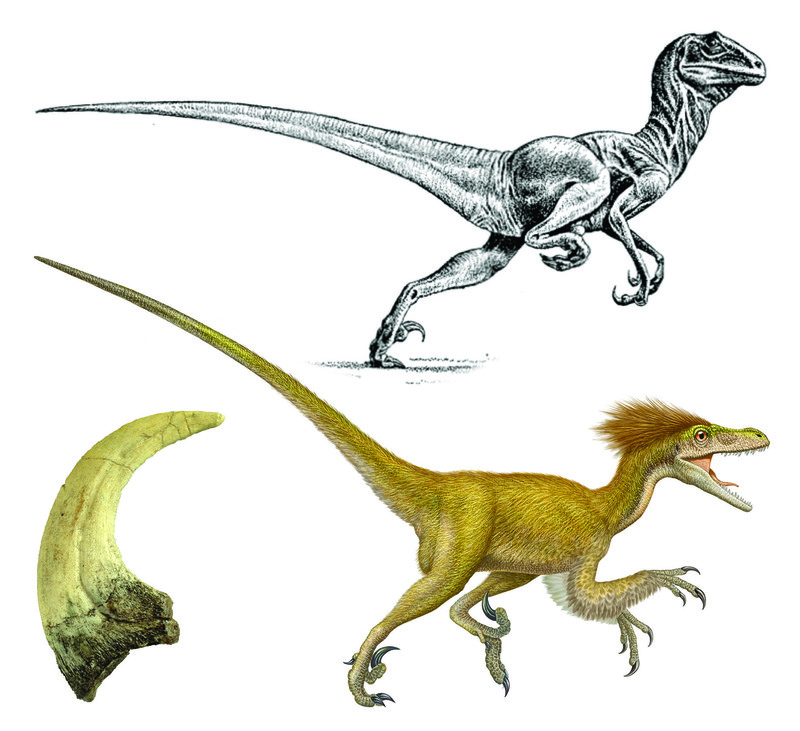 This species was originally depicted as naked (top), but recent evidence suggests that it was covered with “dino-fuzz” as shown here (bottom). A fossil of the sharp hind “killing” claw is also shown (bottom left). Late one hot August evening in 1964, near Bridger, Montana, the palaeontologist, John Ostrom, and his assistant, Greg Meyer, made a discovery that revolutionized the study of ancient birds. Towards the end of a hard day in the field, they spotted, in the slanted light, some claws and bones protruding from the reddish-brown soil. Scrambling to the spot, they began digging with the only tools they had at hand—a jackknife, a small paintbrush and a whisk broom. Rapidly running out of natural light, they marked the location so they could resume work the next morning. Given the fossil’s sickle-like claws, Ostrom was convinced this was a carnivorous dinosaur: I was almost certain, although still wary, that we had discovered something totally new. And they had, as the subsequent week of excavation revealed—a specimen considered by some to be the most important dinosaur discovery of the mid-twentieth century, an animal Ostrom called Deinonychus, ‘the terrible claw’. This was a 70-kg bipedal runner with sharp claws on all four feet, and an especially outsized, sharp, retractable claw on the second toe of each hind limb. Deinonychus was a killing machine, and its study revolutionized our understanding of how dinosaurs lived and breathed, and how birds evolved. Deinonychus was a member of the Dromaeosauridae, a family of theropod dinosaurs—including Velociraptor made famous by the movie “Jurassic Park”—that proliferated in the Cretaceous. Like so many others who influenced ornithology in the early twentieth century, Ostrom started out studying medicine. Growing up in Schenectady, New York, he began his pre-med studies there at Union College in the late 1940s. Prophetically, one of his course requirements was to study evolution so—keen student that he was—he started to read the course text, Simpson’s (1949) The Meaning of Evolution, the night before the first lecture. Enthralled, he spent the night reading, then wrote to the author, the eminent palaeontologist George Gaylord Simpson to say how excited he had been by what he had read. Much to Ostrom’s surprise and delight, Simpson answered right away, inviting Ostrom to come and study the palaeontology of mammals with him at Columbia University in New York City. To the chagrin of his parents, Ostrom abandoned his medical studies and moved to the big city in 1951 to begin a PhD on the palaeontology of reptilian dinosaurs, in the end working with a leading dinosaur specialist, Edwin H. Colbert, rather than Simpson. Six years after obtaining his PhD, Yale hired Ostrom back as their curator of vertebrate palaeontology at the Peabody Museum, a post held a century earlier by one of the great American palaeontologists, Othniel Charles Marsh. Marsh held the first Chair of Paleontology at Yale, a post created especially for him in 1866. Ever the entrepreneur, he persuaded his wealthy uncle, George Peabody, to donate funds to establish a museum at Yale so Marsh would have a place to store and display his fossil discoveries. And discover he did—in 20 years of exploration he and his crew found more than 1000 new species of fossil animals, including 80 new dinosaurs, the first pterosaurs from North America, and a new group of fossil birds, with teeth, which he called the ‘Odontornithes’. Marsh’s ‘Odontornithes’, as presented in his 1880 monograph, included Hesperornis regalis (‘the royal bird of the west’) and Ichthyornis (‘fish bird’), both of which he had described for science. These new birds were related to Archaeopteryx—one of the most famous fossils ever found—and all three of these early birds had teeth, suggesting to Marsh that birds had descended from the toothed reptiles, especially the dinosaurs. Charles Darwin was thrilled: Your work on these old birds, and on the many fossil animals of N. America, has afforded the best support to the theory of evolution, which has appeared within the last 20 years. It is late afternoon on an early winter evening; a flock of European Starlings is foraging busily in a grassy field. A Peregrine Falcon appears high in the sky, and the starlings crouch in fear. As the raptor glides away, apparently uninterested, the starlings resume feeding in the grass. They eventually take flight in an untidy flock and head towards their roost. Suddenly the peregrine is back, and in an instant the starlings bunch together in flight, weaving and undulating in unison as the raptor swoops at them. The peregrine is trying to break up the flock and isolate a victim, but the tactic fails. The starlings disappear into their reed bed roost; the falcon searches elsewhere. In his landmark book, The Study of Instinct, Niko Tinbergen (1951) used his observations on the response of birds to the presence of an aerial predator to draw some general lessons about bird behaviour. The most important of these was that the escape response is instinctive, triggered by the raptor’s distinctive silhouette. Tinbergen’s conclusions emerged from his observations and experiments, including some conducted with Konrad Lorenz, in 1936, in which they recorded the reactions of young (and hence, behaviorally naïve) domestic turkeys, ducks and geese to a model bird ‘flying’ overhead (Lorenz 1939; Tinbergen 1939). While flawed in certain respects, as we discuss later, these and other experiments were important in shaping Tinbergen and Lorenz’s developing ideas. Their bird model was a cardboard silhouette, shaped like a ‘T’, with a short ‘neck’, a long ‘tail’ and symmetrically shaped wings. Remarkably, when the model was flown with the short end first, the young birds crouched in fear, but if it passed over in the opposite direction, with the long end first, the young birds ignored it. Tinbergen realized immediately that the young birds’ interpretation of the silhouette must have been based on the direction of movement; with a short neck and long tail saying ‘predator’ or ‘hawk’ and a long neck and short tail saying ‘no predator’ or ‘goose’ (Tinbergen 1948). In a similar vein, the German ornithologists Oskar and Magdalena Heinroth commented in the 1920s that young birds sometimes exhibited the escape reaction in response to the sudden appearance of Swifts, whose silhouette resembles a predator (Heinroth and Heinroth 1924-1934). That idea was first tested in the 1930s—before Lorenz and Tinbergen conducted their experiments—by German ornithologist Friedrich Goethe, who exposed Capercaillie chicks to differently-shaped silhouettes and noted that the more closely those shapes resembled a predator, the greater the escape response (Goethe 1940; cited in Schleidt et al. 2011). Tinbergen and Lorenz were also aware of the work by another German, Heinrich Krätzig—a promising young researcher killed in the last days of WWII—who tested hawk-goose silhouettes with Ptarmigan chicks. It was he who first noted how a T-shaped model presented as a ‘hawk’ elicited an escape response, while the same model presented in the ‘goose’ direction did not (Krätzig 1940). 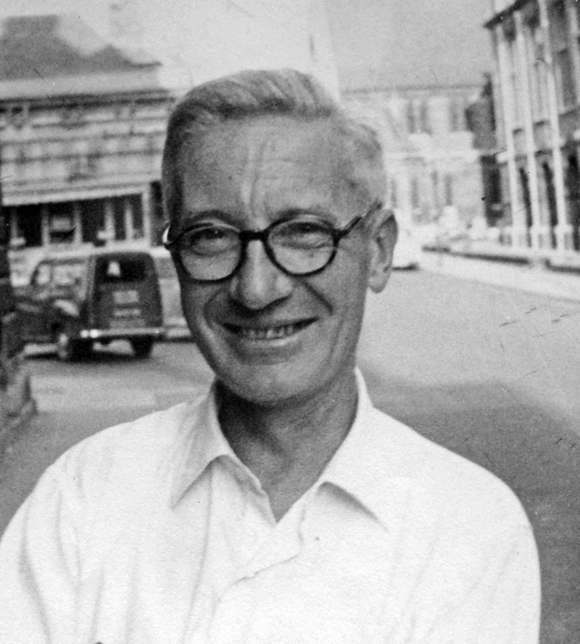 As Tinbergen recognised, the behaviour of the young birds could be interpreted at several different levels. First, their ability to identify a predator seemed to be innate, or instinctive; not something that a young bird had to learn. Second, through ingenious forwards-and-backwards experiments with the T-shaped silhouette, he identified the cause of the prey’s evasive response: only the short-neck and long tail released the escape behaviour. Third, Tinbergen considered the adaptive significance of the behaviour, recognising that by bunching tightly together in flight, starlings reduced the chance of attack. He sometimes called this the immediate function of behaviour, meaning its advantage in terms of survival. Niko Tinbergen was one of the founders of ethology—the study of the behaviour of animals in their natural environment—a field that is now called simply ‘animal behaviour’. Ethology’s main focus, initially at least, was on instinct and the causation of behaviour. Tinbergen’s genius, however, was to see that there were also other questions that could be asked about behaviour, and it was this, among other things, that set him apart from those who simply watched and wrote about birds behaving. Few ideas in science are truly original, and Tinbergen like many others built on the ideas of his precedessors. To see who these were and how Tinbergen rose to such eminence, we need to go back to the beginning of the nineteenth century and the very beginnings of field ornithology.